Navy coach Ken Niumatalolo's team defeated Memphis in a matchup of contenders within the West Division of the American Athletic Conference -- but his Midshipmen can't get too overconfident against the lesser Lehigh. ANNAPOLIS, Md. (AP) — Navy seemingly faces a lesser opponent this weekend in Lehigh, a member of the Football Championship Subdivision. 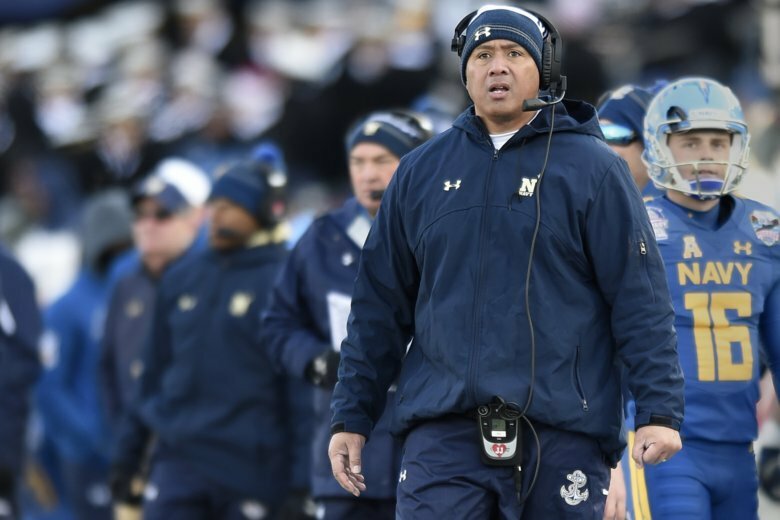 At least that’s the perception the Midshipmen conveyed during a lackluster mid-week practice that drew the ire of coach Ken Niumatalolo. The coach was worried that his players were overconfident after defeating Memphis 22-21 in a matchup of contenders within the West Division of the American Athletic Conference. “We win one game by a point and you practice like this?” Niumatalolo yelled after Wednesday’s session. Lehigh (1-1) is the two-time defending Patriot League champions, and Navy (1-1) is only two weeks removed from a 59-41 loss at Hawaii. When the Naval Academy began playing football, Lehigh was a traditional opponent. The teams first met in 1889, a 26-6 win by Lehigh. Navy and Lehigh played 17 times between 1889 and 1913 before the series went dormant for 70 years. Navy beat Lehigh, then a Division I-AA opponent, in 1983, 1984 and 1986. However, the Engineers turned the tables on the Midshipmen in 1987, winning 24-9 at Navy-Marine Corps Memorial Stadium. The will be the 22nd game between the teams, all of which have been held in Annapolis. Lehigh has been one of the dominant football programs in the Patriot League, capturing five championships during the 12-year tenure of head coach Andy Coen. This marks the first time in 15 years that Lehigh has played a Football Bowl Subdivision school. The last time was in 2003, when Lehigh lost to Connecticut, 35-17. Navy has not lost to a FCS opponent since getting upset by Delaware, 59-52, in 2007. The Blue Hens, who were led by current Baltimore Ravens quarterback Joe Flacco, wound up losing in the FCS championship game that season. Ken Niumatalolo is 9-0 against FCS foes. Last season marked the first time since 2006 the Midshipmen did not face an FCS foe. Lehigh is coming off a 31-9 loss to Villanova, which is ranked No. 10 in the latest FCS Coaches Poll. Coen knows the prospect of pulling a stunning upset is unlikely. He simply wants the Mountain Hawks to savor the experience and improve while doing so. The game was originally slated to be held the weekend before the rest of college football got underway. Coen said that would have been more conducive because Lehigh could have spent most of August training camp preparing for Navy’s triple-option. “Obviously, trying to defend the triple-option is no small task, and Navy is the best in the business at running that offense,” he said. Lehigh will be without standout tailback Dominick Bragalone, the Patriot League Offensive Player of the Year in 2017. Bragalone became the school’s all-time leading rusher in the season opener against St. Francis and now has 3,722 career yards. Coen said Bragalone suffered a head injury versus Villanova and will be held out Saturday as a precaution. Bennett Moehring set the Navy record for career extra points during the Memphis game. He has now kicked 113 conversions, surpassing Nick Sloan (2012-2015) on the career list. Moehring needs just eight points to move past Joey Bullen (2005-2007) into fifth place on the school’s all-time chart. The senior from Arkansas currently has 164 points, a bit shy of the school record of 192 held by Steve Fehr (1979-81). Navy’s top five leaders for career points are all kickers.